I am running the latest version of Linux Mint with Cinnamon. I'm trying to map Caps Lock to Ctrl, but I cannot figure out how to do it. All web searches I've done have led me to older versions of Linux Mint (there is no keyboard layout option in my settings). How can I do this? and run the command xmodmap ~/.xmodmap. You can put this command in whatever startup files are processed by your WM or DE. This will only work in X but it will work regardless of what graphical environment you use. Go to settings > regional preferences > keyboard layouts > settings and expand the caps lock section. I realize that this already has an accepted answer, but here is the One True Way to change Caps Lock to ctrl. This works on all versions of Linux, all distros, for the entire system (console, X, whatever). It sets the mapping in the kernel where it should be. Add this to a start up script (e.g., /etc/rc.local, or create your own). 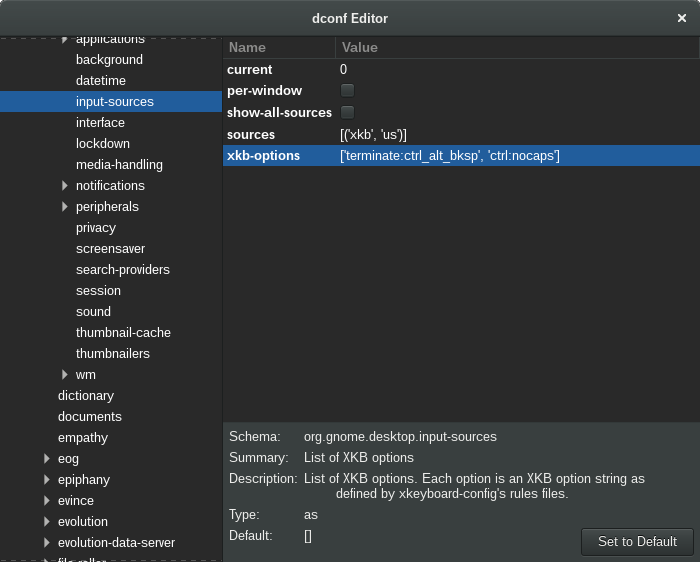 On Debian (and derivatives) dumpkeys/loadkeys is part of the kbd package, if for some reason it's not already installed. 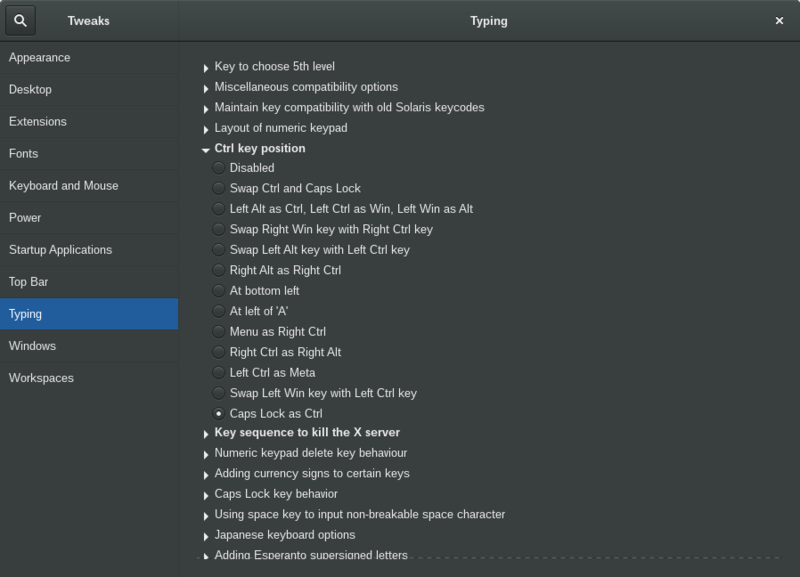 On Mint 17.2, select Preferences -> Keyboard -> Layouts -> Options, select Caps Lock key behavior, select "Make Caps Lock an additional control." Updating this thread for Linux Mint 18.3 (Beta) as this option seems to be a moving target. Click on Control Center from the Start Menu and select the Keyboard button. In the popup window, select the Layouts tab. In the Layouts window. click on the Options button towards the bottom. In the Options list, expand the one that says "Ctrl key position". Towards the bottom select the checkbox next to "Swap Ctrl and Caps Lock". Not the answer you're looking for? Browse other questions tagged linux-mint x11 keyboard-shortcuts xkb xmodmap or ask your own question.